"In many ways, I was an independent woman," writes Pulitzer Prize–winning journalist Alice Steinbach. “For years I’d made my own choices, paid my own bills, shoveled my own snow.” But somehow she had become dependent in quite another way. “I had fallen into the habit of defining myself in terms of who I was to other people and what they expected of me.” But who was she awa "In many ways, I was an independent woman," writes Pulitzer Prize–winning journalist Alice Steinbach. “For years I’d made my own choices, paid my own bills, shoveled my own snow.” But somehow she had become dependent in quite another way. “I had fallen into the habit of defining myself in terms of who I was to other people and what they expected of me.” But who was she away from the people and things that defined her? In this exquisite book, Steinbach searches for the answer to this question in some of the most beautiful and exciting places in the world: Paris, where she finds a soul mate; Oxford, where she takes a course on the English village; and Milan, where she befriends a young woman about to be married. To ask other readers questions about Without Reservations, please sign up. I loved this book! Reading it was like sitting at a table across from the author with a pot of tea between us. Parts of it brought tears to my eyes. This woman has a zest for life and an ability to make friends wherever she goes. I envy her! She falls in love in Paris, meets a bride-to-be in Milan, and learns ballroom dancing in Oxford. What an adventure! What a story! I picked up this book because it was recommended on The Ultimate Reading List. The back cover called Steinback a "Pulitzer Prize-Winning" journalist, so I anticipated something special. Unfortunately, the author inspired the snarky in me right from the introduction. She said she decided to travel because she had dropped into "the habit of defining myself in terms of who I was to other people." Oh, so this was going to be one of those "find myself" books, was it? I'm rather suspicious of that kin I picked up this book because it was recommended on The Ultimate Reading List. The back cover called Steinback a "Pulitzer Prize-Winning" journalist, so I anticipated something special. Unfortunately, the author inspired the snarky in me right from the introduction. She said she decided to travel because she had dropped into "the habit of defining myself in terms of who I was to other people." Oh, so this was going to be one of those "find myself" books, was it? I'm rather suspicious of that kind of quest--I don't think we can plan self-discovery, and if and when we do it's often in challenging ourselves in some in some way--not by being tourists in comfy vacation spots in Paris, London and Milan. Travel books are interesting for two reasons. Either the traveler--and their voice, their writing--makes it interesting, or the destination does--because it's exotic to the reader or the traveler finds themselves in the midst of exciting, historic times. Neither is the case here. I found the writing, at best, undistinguished. One reviewer noted the overuse of the colon. I thought Steinbach overused the question mark--use of the rhetorical question abounded. I agreed with the reviewer who called Steinbach's metaphors and literary allusions forced. And I found the chirpy postcards she sent to herself heading the chapters--signed, "Love Alice,"--trite and cringe-worthy. Satisfied. That's how I felt after finishing Without Reservations: The Travels of An Independent Woman. by Alice Steinbach. This book has been on my travel book shelf for ages. Every time I thought I'd read it I'd pass it on by. Originally I thought I'd read it for the travel aspect. Now as I get ready to retire it seemed just the right time to read Steinbach's take on the journey of a lifetime; an exploration of self discovery. Steinbach, a Pulitzer Prize winning journalist considered herself a Satisfied. That's how I felt after finishing Without Reservations: The Travels of An Independent Woman. by Alice Steinbach. This book has been on my travel book shelf for ages. Every time I thought I'd read it I'd pass it on by. Originally I thought I'd read it for the travel aspect. Now as I get ready to retire it seemed just the right time to read Steinbach's take on the journey of a lifetime; an exploration of self discovery. Steinbach, a Pulitzer Prize winning journalist considered herself an independent woman in some ways but not in others. I think this describes many women I know, both those working or not. She explains that she had gotten in the habit of defining herself by what and who she was to other people and began to wonder who she was removing this from her life. She decides to take a sabbatical from work and sets off to Paris, Oxford, Milan among other inviting locales in the world to see if she can discover who Alice is. One thing I absolutely loved is that Steinbach begins each chapter with a postcard sent to Alice from Alice. I have always like doing this...send myself a postcard to remember a place I've been and record feelings it evoked. I found myself nodding, smiling, laughing, and applauding Steinbach as I read through her thoughts and adventures on this journey. Many, many, sticky book darts graced the pages before I was done. There were so many passages that resonated with me. I just liked the way Steinbach expressed herself. I loved the way she opened herself to what may come, by taking the risk to leave the job and family and by allowing herself to embrace new things and to meet new people, make new friends, if not for a lifetime, for the moment. "looking into the mirror that others hold up to me." Worrying about children is high on the list, too. And it makes no difference, as I well knew, whether the children are three or thirty. A child is a child, is a child. At least in the the eyes of a parent." Walking back to Radcliffe Square, I thought of something my mother used to read to me. It was a passage from a book by her favorite naturalist, Wendell Berry. In it he offers advice to those about to enter the wilderness "Always in the big woods when you have familiar ground and step off alone into a new place," he wrote, "there will be, along with the feelings of curiosity and excitement, a little nagging of dread. It is the ancient fear of the Unknown, and its is your first bond with the wilderness you are going into." Now that summer is officially over, and I spend most of my waking hours sequestered in a classroom, I seek out travel books so that at least my mind can pretend it is somewhere else. Usually, I am attracted to exotic travel tales, so at first I was not that impressed that Alice Steinbach chose to spend her six months abroad in western Europe. I could not imagine what exciting adventures she could get into in England, France, and Italy, but as I read on Alice explained that the point of her trip Now that summer is officially over, and I spend most of my waking hours sequestered in a classroom, I seek out travel books so that at least my mind can pretend it is somewhere else. Usually, I am attracted to exotic travel tales, so at first I was not that impressed that Alice Steinbach chose to spend her six months abroad in western Europe. I could not imagine what exciting adventures she could get into in England, France, and Italy, but as I read on Alice explained that the point of her trip was not to discover a crazy adventure but to rediscover the adventurer she used to be before life and responsibilities took over. As a divorced woman with two grown children, Alice decided that she had reached a point where she could go out and find the woman she used to be. Traveling along with Alice was like sitting down and taking some good life lessons from a wiser, older woman. I saw that in her fifties, she was dealing a lot with looking back at the past, at those who she had lost throughout her life, and reconciling those loved ones with the new people she was meeting in her travels. A bittersweet element came out. A big lesson that I try to learn is to say yes to more things than you say no to. Just the other day, as I was taking a walk around the corner from my parents house, I stopped in front of a large McMansion. Its garage was open, and a lady sitting on a lawn chair was barbequing something that smelled delicious. In all my years of growing up in Plainview, I had never seen someone bbq in front of their house. Practically no life happens out front. The food smelled so good, so even though I just had dinner, and I never do things like this, I called out, "It smells really good." "What?" the lady called back. "It smells really good," I called back. "Come," she said waving the spatula. "Come get something to eat." It was with this last sentence that I heard her thick accent and felt things made more sense. I wondered what country she was from, where they make really good bbq and talk to their neighbors. Was I the first neighbor to ever greet her. It was possible in Plainview. And then I said, "No. No thank you." and I continued walking around the block. The no was a reflex action based on too many demands too many times in too many days. I hated that reflex action. Like Alice, I want to say yes. I want to wander around again and hopefully next time join this woman for a bbq. This was kind of like listening to a friend tell about her trip. You really want to hear about it, you really do, but then she just keeps going on and on about the little details that don't really matter to anyone but her. At one point, it sounded like bragging. I would have enjoyed more about the people and less about the little things she did, like shoe shopping. She didn't even bring back the relevance of buying the shoes. This was a book that I couldn't wait to end. I think I'm too cynical for books like this. I think I like the idea of them more than I like the reality. The basic premise - middle-aged divorced mother of two suffering from empty-nest-syndrome drops out of her life to travel around Europe alone and 'find herself' - is so overdone, so clichéd, that I almost found myself rolling my eyes on every page. I found it an enjoyable enough read, don't get me wrong - it's always entertaining to see familiar places through others' eyes, and Steinbach is I think I'm too cynical for books like this. I think I like the idea of them more than I like the reality. The basic premise - middle-aged divorced mother of two suffering from empty-nest-syndrome drops out of her life to travel around Europe alone and 'find herself' - is so overdone, so clichéd, that I almost found myself rolling my eyes on every page. I found it an enjoyable enough read, don't get me wrong - it's always entertaining to see familiar places through others' eyes, and Steinbach is a lively, engaging writer - but I didn't find it inspiring or motivating, powerful or insightful. Taking six months' out to visit three countries, stay in fine hotels and eat out in restaurants and cafes for every meal is, to me at least, hardly bold or daring, hardly a radical change of life. It's basically the extended holiday we'd all love to take. Her depictions of Paris, London, Oxford, Venice and Rome may seem exotic to those who have never visited them, but her stereotypical, idealised depictions bear little resemblance to the places I've visited. Every alley is a hidden gem of cobblestones and unique boutiques; all the women are chic and elegant, the men handsome and interesting; the food is always good, the wine excellent, the art and history inspiring, the company apparently immediately friendly and engaging. If only we could all move through life like this! Recommends it for: All women! I LOVED the comments that Alice Steinbach made during her travels. So many astute observations that I found myself nodding in agreement with. An excellent book to inspire the soul with. As I told the friend that I passed Without Reservations on to, this book retaught me that we are not defined by where we come from, what we do, or the roles we have come to fulfill: we simply are who we are. And that's just how it should be. "Dangerous": Made me want to sit in a cafe and write in my journal all day I LOVED the comments that Alice Steinbach made during her travels. So many astute observations that I found myself nodding in agreement with. I really enjoyed this book. It was a very easy read - she writes simply and the chapters are short. If you have ever traveled to Paris or Italy, you'll like her descriptions and how she connected differently to each city/area. Also, it is not just a travel book, but a book about self-discovery at an older age. A nice bonus: the author offers a great idea for how to keep a diary/document your travels: she write & mails postcards home to herself. What a wonderful idea! Hope some of you pick thi I really enjoyed this book. It was a very easy read - she writes simply and the chapters are short. If you have ever traveled to Paris or Italy, you'll like her descriptions and how she connected differently to each city/area. Also, it is not just a travel book, but a book about self-discovery at an older age. Hope some of you pick this up: very worthwhile. In 1993 Steinbach, then in her fifties, took a sabbatical from her job as a Baltimore Sun journalist to travel for nine months straight in Paris, England and Italy. As a divorcee with two grown sons, she no longer felt shackled to her Maryland home and wanted to see if she could recover a more spontaneous and adventurous version of herself and not be defined exclusively by her career. Her innate curiosity and experience as a reporter helped her to quickly form relationships with other English-spe In 1993 Steinbach, then in her fifties, took a sabbatical from her job as a Baltimore Sun journalist to travel for nine months straight in Paris, England and Italy. As a divorcee with two grown sons, she no longer felt shackled to her Maryland home and wanted to see if she could recover a more spontaneous and adventurous version of herself and not be defined exclusively by her career. Her innate curiosity and experience as a reporter helped her to quickly form relationships with other English-speaking tourists, which was an essential for someone traveling alone. In Paris she fell in love with Naohiro, and in the months that followed she met up with him occasionally at various European locations. From France she continued to London and Oxford, where she completed a course on the history of the English village. Then on to Milan, Venice, Rome, Siena and Asolo; throughout the trip but especially in Italy, the words of Freya Stark (via The Journey’s Echo) were Steinbach’s inspiration. I'm giving up on this book - it just didn't keep me interested. It's hard for me not to just finish it as I hate leaving a book before the end, but I just can't do it. I wish I could give this something stronger than a "didn't like it." This book was terrible - the writing and the story are treacly and shallow. I have itchy feet. I'm ready to pack and head somewhere. 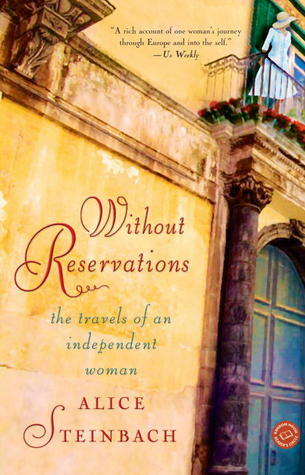 Alice Steinbach's Without Reservations: The Travels of an Independent Woman entices me to travel to Paris or Ireland or Lisbon, Portugal, the places that beckon to me. If you're an armchair traveler, Steinbach may encourage you to pack as well. In 1993, Steinbach was a reporter with the Baltimore Sun. She was a single mom, but now her sons were grown, and she was wondering who she was. Steinbach identified herself as a mother and a reporter I have itchy feet. I'm ready to pack and head somewhere. Alice Steinbach's Without Reservations: The Travels of an Independent Woman entices me to travel to Paris or Ireland or Lisbon, Portugal, the places that beckon to me. If you're an armchair traveler, Steinbach may encourage you to pack as well. In 1993, Steinbach was a reporter with the Baltimore Sun. She was a single mom, but now her sons were grown, and she was wondering who she was. Steinbach identified herself as a mother and a reporter. Who was she outside of her job? The newspaper agreed to give her a leave of absence, and Alice Steinbach headed to Europe. She started in Paris. It's hard to do justice to Alice Steinbach's book. It's an introspective travelogue. Chapters begin with postcards she wrote home to herself. In writing the book, she can look back and remember where she was, people she met, and, most important, the Alice Steinbach she found when she was in each of those places. She says she was learning about herself as she travels. Alice Steinbach felt at home in Paris. But, she questions herself in the book, and she asks questions about other women. Are women alone independent or living in solitude? And, although she loves Paris, she meets a man there who changes her feelings about her own independence. She's always eager to see him, but she worries about his feelings for her. It's impossible to separate Alice Steinbach's travels from her feelings about this man because she meets him throughout the trip. But, she also manages to find female friends along the way. She spends time in Paris, London, Oxford, England where she takes a course, studying English villages. She travels to Milan and Venice. I admire Alice Steinbach, her independence while she travels. This is a book that doesn't dwell on food or shops or sites. It's an account of people she met in those cities. As a traveler who appreciates the people I spend time with on trips, I loved that. I'm envious of her independence. At the same time, one aspect of this book bothers me. And, this is just my feeling. At times, she seems too eager to meet and please a man. However, for Steinbach, I think that was part of the romance of the trip itself, the romance she found. At first I was a little leary of reading this travel memoir. I was afraid of my mental comparison to "Under the Tuscan Sun" (which I could not finish). I'm glad I did not pass up the opportunity to travel with Alice across Europe. Alice observes the countries in the way I would like to--to not get caught up in the "big" things we are all are supposed to see but to relish in the small and everyday beauties different countries/cultures have to offer us. In my younger years, whenever I traveled it became all about the perfect photo, or how much stuff I could cram in the day to make the most of my trip. As I've grown older, I've learned to lay off the camera a little more and just sit back and watch. Oh sure, if I only have a day I still might choose to pack a day with sights but I've decided to give myself permission to just "be" and watch others in the same state. Upon turning the first pages of this book, I note the contents. I am planning a trip to Europe in the spring and I notice Steinbach's travels are Paris, London, Oxford, and Italy. I'm excited because these are the EXACT locations I plan to travel to. Paris (not all of France), London (not all of England) and Italy, just as she's named; the entire country. Hmmm....quite interesting; I'm was immediately intrigued. This book did not disappoint. Alice takes a leave from work and her busy life to tra Upon turning the first pages of this book, I note the contents. I am planning a trip to Europe in the spring and I notice Steinbach's travels are Paris, London, Oxford, and Italy. I'm excited because these are the EXACT locations I plan to travel to. Paris (not all of France), London (not all of England) and Italy, just as she's named; the entire country. Hmmm....quite interesting; I'm was immediately intrigued. This book did not disappoint. Alice takes a leave from work and her busy life to travel to Europe with the primary plan of not having a plan. She truly wanders the cities, meets new people, explores random places on a whim. She is successful in her goal to travel as a spontaneous person; so different from her normal self. A great inspiration to pause and appreciate all the little things ...with the backdrop of many gorgeous European cities. This is summarized by a quote from the book, "What adds up to a life is nothing more than the accumulation of small daily moments." This book seemed bland. I wondered how it got published, versus more deserving books, but I assume the author, a journalist, had a built-in audience. She tells some of WHAT happened, in summary (she gets ill and is helped by people, she has an affair) but she doesn't provide much detail of HOW it happened. The reader doesn't experience it. How many of us fall into patterns that we become dependent on? We do the same things with the same people because that is how we have always lived our life. I believe it takes effort and independence to change this inclination to be who we have always been. Alice Steinbach has the chutzpah to make changes to her life. She decides to put her independence to the test. I admire her for that. To journey by yourself to Europe without a complete itinerary, seems difficult to me. Steinbach goes to Paris How many of us fall into patterns that we become dependent on? We do the same things with the same people because that is how we have always lived our life. I believe it takes effort and independence to change this inclination to be who we have always been. Alice Steinbach has the chutzpah to make changes to her life. She decides to put her independence to the test. I admire her for that. To journey by yourself to Europe without a complete itinerary, seems difficult to me. Steinbach goes to Paris, parts of England and a number of Italian cities. She is a successful traveler. It sounds like fun to part of me and then the rest of me wants my travel to be comfortable. I enjoyed this book even though I probably will never do anything like this. Steinbach has reminded me that learning and doing new things can be fun. Go on a trip through Europe without leaving your home with famed journalist Steinbach in this wonderful travel memoir. Steinbach does a fabulous job of not only setting the visual scenes of each locale, but also adding her own personal sensibility to each page. She did all of the traveling she talks about in this book all on her own so the stories are, in addition to being about European ways and customs, about the life of the single wanderer. Since this book is more about the author and less ab Go on a trip through Europe without leaving your home with famed journalist Steinbach in this wonderful travel memoir. Steinbach does a fabulous job of not only setting the visual scenes of each locale, but also adding her own personal sensibility to each page. She did all of the traveling she talks about in this book all on her own so the stories are, in addition to being about European ways and customs, about the life of the single wanderer. Since this book is more about the author and less about the details of the cities she visits, it’s not for someone looking for in-depth information on Europe. Others wanting a general view of experiences waiting for them abroad will be pleased, though. Steinbach put aside her job as a writer for the Baltimore Sun to travel in Europe with no agenda other than to rediscover who she was as a woman. She had been a wife, a mother, and a writer, but she felt as if she had somehow lost who she was to herself. Having traveled to many of the locations that she went, I found myself reminiscing about my own vacations. I really loved the way that she wrote as well. I didn’t expect to like this book as much as I did. It was available at my local library and looked like a easy relaxing read. What I was surprised to find, was that Steinbach’s introspection throughout her travels were often smart and deeply nostalgic—the kind of wisdom that perhaps can only be thoroughly appreciated after age and experience has settled deep in your bones. Her reflections of motherhood long past are full of depth—she writes about the measurement of time for a young mother is qu I didn’t expect to like this book as much as I did. It was available at my local library and looked like a easy relaxing read. Her reflections of motherhood long past are full of depth—she writes about the measurement of time for a young mother is quantified by her children’s milestones and schedules and speaks of the strange transition for a woman when her children have grown and gone, when she must find new ways to meaningfully measure time. She also writes about the process a mother inevitably goes through in letting her children go. When they need you less, that time when they grow up and go, yet your desire for closeness remains. She describes her feelings of being ambushed by her love for her now grown sons in such a tender way, like grasping at a shadow. A notion that is hard to imagine in the throws of young motherhood, yet is around the corner waiting to reveal itself with a certain suddenness. Yet she comes to the realization that her feelings of emptiness frees up more space to love the grown men they have become. It wasn’t necessarily where she travelled that I enjoyed, as much as I savored a few of her revelations and reflections along the way—One particularly smart assessment she made was that the older immigrant feels something the young do not. And when she briefly explains it through her grandmother’s experience, you realize its so profoundly true you feel grateful she helped reveal a kind of truth you may not have fully grasped. It’s not the perfect travel book, but it seems to be perfectly honest. This one all but leapt into my arms as I walked through the 900 section of the library on a gloomy February day. "You need me!" it said. Did I ever. I had really enjoyed Ms. Steinbach's "Educating Alice" a few years ago, and this was equally delightful--an account of her year away from her Baltimore journalist job spent in Paris, London, Oxford, and Italy. I've long thought Ms. Steinbach and I would get along famously. We travel much the same way: architectural marvels and museums, yes, but also This one all but leapt into my arms as I walked through the 900 section of the library on a gloomy February day. "You need me!" it said. Did I ever. "As I stood beneath a street light studying the map, a woman turned the corner and headed for one of the houses. She unlocked the door; a circle of light spilled out. I could see through the door the warm glow of lamps and pictures lining the pale yellow walls. An orange-and-white cat, back arched, tail plumed up into the air, suddently appeared to greet her, rubbing up against her legs. The woman bent to stroke the top of his head; the cat leaned in to her caress. "Did you miss me?" I heard her ask in a voice flushed with affection." I enjoyed her observations and gentle musings. The only reason I was a little stingy with the stars is that at some points I felt she rushed through something I wanted to know all about in a few lines, then went on and on about something inconsequential. I think it was Florence that first made me feel this way, though I might be wrong (have returned book to the library, can't check) but she whipped through it in about three lines and was on to the next. I was thinking, Whoa! Back up! What else happened there? Tell me more about it. I will be looking for more books by this author. Recommends it for: travelers, women, anyone who likes memoirs. I wish I had met reporter, writer, and traveler Alice Steinbach. Or rather, I wish I had known her, for she sounds like a deeply interesting and fascinating woman. In the early 90s, Steinbach was an established reporter with a twice-weekly column in the Baltimore Sun, a single mother of two college-graduate sons, and a successful, independent woman whose life trajectory seemed defined, secure, and predictable. But a restlessness had her questioning who she really was beyond how others defined her I wish I had met reporter, writer, and traveler Alice Steinbach. Or rather, I wish I had known her, for she sounds like a deeply interesting and fascinating woman. In the early 90s, Steinbach was an established reporter with a twice-weekly column in the Baltimore Sun, a single mother of two college-graduate sons, and a successful, independent woman whose life trajectory seemed defined, secure, and predictable. And so begins what Steinbach calls her “Year of Living Dangerously,” when, with encouraging friends and approving bosses and sons, she embarks on her sabbatical of travel. Her visits to Paris, London, Oxford, Venice, Milan, and Siena are not touristy, hasty jaunts from A-to-B-to-C, but lengthy, months-long sojourns in each place, enabling her to soak up the atmosphere of new settings and make real cultural connections. Steinbach is a prolific postcard writer, but they are all written to herself from herself, capturing some precious moment, pleasant revelation, or exquisite experience. Alice Steinbach, whose work at the Baltimore Sun was awarded the Pulitzer Prize for Feature Writing in 1985, has been a freelance writer since 1999. She was appointed the 1998-1999 McGraw Professor of Writing at Princeton University and is currently a Woodrow Wilson Visiting Fellow. She lives in Baltimore, Maryland.